The plug-in can move all notes that were accidentally inserted in upper layers to layer 1. It doesn't do it when the layer has different playback attributes or if it contains resized notes (probably cue notes). The option "Remove Unnecessary Use of Layers 2-4" is checked by default. 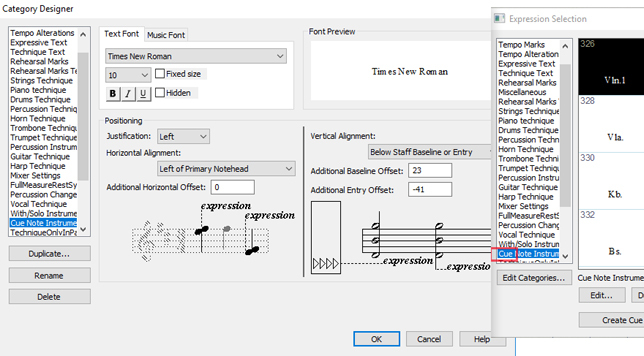 The Perfect Layout plug-in has a few functions dedicated to cue notes and cue texts. During initalization of the plug-in it tries automatically detect the "Cue Note Layer" and, if used, a "Cue Lyrics Layer w/Hidden Notes" (which some use for lyrics scaling). If no cue notes were found, then these options ("Dedicated Cue Note/Lyrics Layer") cannot be set. The plug-in processes cue texts created with Finale's "Add Cue Notes" plug-in like "Fl." or "Trb.1" if they are placed in a dedicated expression category. To detect this expression category it looks if the category names include the keyword listed in the option "Keyword for Categories with Cue Expressions" (set to "cue" by default).